Part of being on the road is the ability to have lunch on the company, which, in turn, gets billed to the client. Some people might take advantage of that situation but I don't like to head straight for the highest priced restaurant on the trip. I'd rather eat something I'm familiar with. Steak 'n Shake in South Bend, Indiana is my preferred choice. I've blogged about this place before. They had lousy service the first time I was here, but that has changed. They don't always come quickly after you've been seated, but it's reasonably soon and they do bring the food out fast and check to see that things are fine, the two items I had a lot of trouble with the first time I stopped here. Steak 'n Shake is having a promotion now. 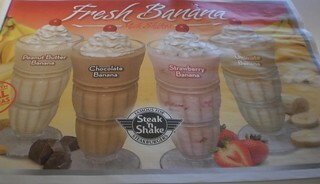 They have 4 new limited time shakes, all featuring bananas. 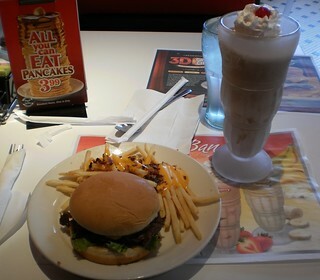 Of course I had to try the chocolate banana shake with my usual bacon cheeseburger and bacon cheddar fries. I was underwhelmed by the shake. There was the distinct flavor of banana and I occasionally stumbled upon a small chunk of banana in the shake. But there wasn't much of a mix of chocolate. Both flavors should be evident in something like this. Banana clearly ruled. I'm thinking they make a regular chocolate shake and the add banana puree. That would work if the chocolate shake was heavily chocolate. Steak 'n Shake's regular chocolate shake isn't the intense chocolate it could be so marrying the banana with the chocolate produces a lackluster flavor. It also does not inspire me to, if I were to be sent that way again, try the other flavors in this quartet. I'll stick to their intense Double Chocolate Fudge shake. Now THAT's chocolate. Bottom line is, if you don't want intense flavors, this is probably a good shake for you. If you want to taste both flavors, this isn't. I did, however, get my bacon cheese fries so I'm set for a long time.